Virgin Galactic's SpaceShip Two (also known as the VSS Enterprise) is on track for its first commercial flight scheduled for some point in 2011, having completed its first successful test flight with a full crew on board earlier this month. The spacecraft's first flight with a full crew on board was a major milestone in Virgin's plans to launch a fully-commercial space travel company in 2011. The test flight took place at the Mojave Air and Space Port, with SpaceShipTwo attached to the VMS Eve "mothership" throughout the flight, which took over six hours. Anticipation was high as Virgin Galactic staff watched SpaceShipTwo take off, particularly as there was a chase plane following the space-craft into the sky, just in case of any emergency. 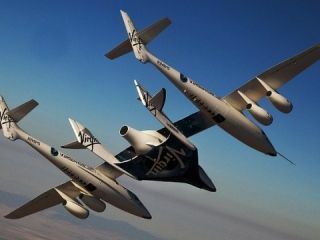 We will bring you all the latest news updates regarding Virgin Galactic's plans for space tourism, as an when we get them. Suffice to say, if you want to head into space in the next decade or two, just make sure to start saving (a lot) now! Wired reports that it was the third captive flight for the spacecraft, and the 33rd flight for the mothership. We look forward to the announcement of the first solo flight of SpaceShipTwo, which should be some time very soon. We've reached out to Virgin Galactic for further information, so stay tuned for updates.